Maintaining rhythm through changes of bend is a key element of completing effortless changes of rein and keeping your horse supple. British dressage list four judge and trainer, Alex Gingell, talks through exercises you can try at home. Riding serpentines, with varying sizes of loops, is a good exercise to practise maintaining fluency. The aim is to maintain an even looseness at all times, as you move effortlessly from one loop to the other. There must be no blocking through the frame when changing the rein and bend. Ride complete 10m circles from E and B without a change of rein. Once you can do this easily, you will know how much bend you need in order to ride a 10m circle accurately. Now, with the feel of that full circle in your head, ride one and a half 10m circles at E.
Ride straight up the centre line when you reach X for the second time – look straight to A or C and you’ll be able to judge your turn exactly. The larger the horse and the larger the natural paces of the horse, the harder a half 10m circle will be to perform. To help you get it right in a test situation, practise riding tighter half circles (perhaps 8m diameter) at home. By doing this, it will make riding a half 10m circle easier at competition. 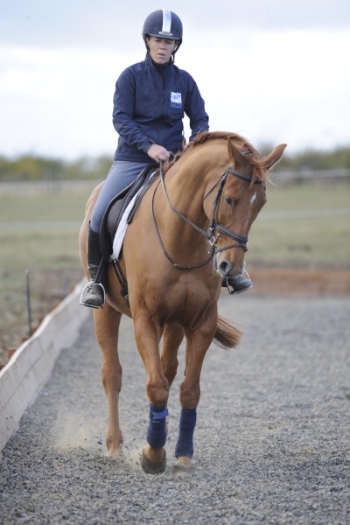 Working on your horse’s bend goes hand in hand with riding deep corners. If you ride these well too, then you should be well set up. Read the full article in issue 447.